Even though it started as a small hometown event, the Big Sur Marathon never saw a local runner win the overall men’s title – at least, not until the 25th presentation. Big congratulations to Danny Tapia of Salinas, a recent Hartnell College runner coached by Chris Zepeda. Even more impressive is that this was Danny’s first marathon; it’s possible that we’ve got a legend in the making for future editions of the race. Coach Zepeda tried making arrangements on Saturday afternoon for Danny to ride the elite bus, a privilege that top contenders in the race are offered by the race committee. Unfortunately, the van was already full, so Danny got up early to catch the Carmel Middle School buses with the “regular” schmoes, before taking off like crazy at the starting gun. He built a big lead after 5 miles, and never looked back en route to a 90-second victory. Next year, we’re guessing he’ll be on the elite bus. Note that we said Danny was the first local men’s winner; on the women’s side, the Big Sur Marathon has had 3 local champions: Patty Selbicky in 1987, Nelly Wright in 1988, and legendary ultrarunner Ann Trason in 1989. Interestingly, all of these women were from Pacific Grove, the same town where 2008 Olympic marathoner Blake Russell currently resides. The lesson, perhaps: if you’re a speedy girl looking to win the Big Sur Marathon, you should definitely consider moving to PG. Blake was at this year’s event as a spectator greeting runners after the race. She has recently returned to competitive running after having a baby a year ago, so if you ever see her on the start line at Big Sur, the smart money will be on her to win big. The JUST RUN Kids’ 3K was held in Pacific Grove for the first time on Saturday and had a record number of participants. About 3,000 kids and parents ran on a beautiful out and back course from Lovers Point. 33 schools participated, and smiling faces were everywhere. Hopefully these are the marathoners of tomorrow. Boston to Big Sur Forever! The Boston to Big Sur Challenge was a huge success, with fantastic feedback from everybody who participated. We’re happy to report that the challenge will be continued indefinitely in years to come. Like this year, the races will probably sell out early; mark your calendars now for the July 15th online entry date for Big Sur’s 26th presentation on May 1, 2011. A special shout-out goes to our running partner Carmella Cuva, for completing the Boston to Big Sur Challenge, for winning the top local female award at Big Sur, and for characteristically smiling her way through both races. We’ve run more miles than we can count with Carmella, so we like to think that some of those mornings together contributed to her amazingly successful week of racing. This year’s race saw 12,000 participants in the various events, with 2,800 volunteers helping them. 365 Porta Potties were picked up. 350 gallons of coffee were consumed, along with 85,000 cups of Gatorade on Highway 1. Post race, 25 kegs of beer vanished, as well as 2400 bagels, 72 gallons of soup, and 100 cases of bananas. The numbers keep getting bigger, and the race keeps getting better. In honor of this weekend’s 25th Big Sur International Marathon, we asked some local runners for their most memorable moments from the first 25 years of the Big Sur International Marathon. Here are some of their responses. Rich Hollaway, founder of Cornuts Inc., heard a rumor in 1985 that Judge Bill Burleigh wanted to start a marathon from Big Sur to Carmel and needed financial support. Rich left a message for the visionary yet resourceless Burleigh, who returned the call in less than 2 minutes. And the marathon was born. I’ve trained hard and I feel strong. My pace is fast, so what can go wrong? The miles fly by, as along I roll. Will the Hurricane Point take its toll? And as I pass a runner, I pause to ask. In my focused state, I missed the hill they dread. To receive the laurel wreath upon my head. 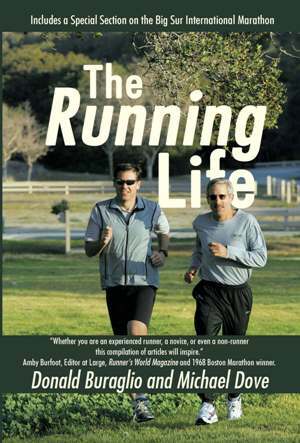 Dr. Marc Lieberman and Andrew McClelland independently commented fondly on scenes from the marathon; running near Pt. Sur Lighthouse in silence and solitude with only cows as company, the struggle with the wind at Hurricane Point, the hail years, the camaraderie of friends running alongside, and being rewarded on the podium for a race well run. 15-time finisher Rick Leach recalled camping at Pfeiffer to get some extra sleep near the starting line. Brushing his teeth in the washhouse, he heard the Star Spangled Banner wafting through the trees, at which point he spit, rinsed, and started running. Crashing through the deserted start area, he caught up with the pack went on to run one of his best marathons – possibly due to the super adrenaline charge at the start. Glynn Wood, the Peninsula’s runner emeritus, housed a young Japanese runner with no marathon experience for the 2nd Big Sur Marathon in 1987. Glynn and his wife Suzie knew no Japanese and their house guest knew no English. At the carbo-loading party before the race, Olympic marathon gold medalist Frank Shorter was the host, and went from table to table with a videographer. For $30 anyone could buy a video of themselves with Frank. The guest wasn’t exactly with the leaders – he ran 4 hours and 30 minutes, but gave Glynn $30 to get a copy of the video, and flew back to Tokyo a satisfied finisher. Sally Smith, the marathon’s long time registrar, focused on last year’s race. For the participants everything always goes smoothly, but for the race committee, it’s a very nervous time. 15 minutes prior to the start, the timing company was no where to be found. Cell phone service in Big Sur is sporadic at best; a connection was made but all that could be heard was “we’re on the way.” The company arrived 6 minutes before the race, set up quickly, and the race started only 1 minute late. The runners never knew, but Sally aged 5 years in those few minutes. For those of you running this year, we hope all your memories are good ones.